the default path for the LO templates is c:\Documents and Settings\<user_profile>\Application Data\LibreOffice\4\user\template This Example is for Windows XP. If you have own templates they are located in the above shown template folder. My suggestion is to delete the \4\ or whatever number in the path shown above. Reason: If LO changes the main Version number from 4 to 5 or from 5 to 6 and so on you need to replace all your old templates you created in the old version. In fact, you can create your own folder and add it to the paths set for your LibreOffice. Go to the menu Tools → Options and select Paths under LibreOffice. 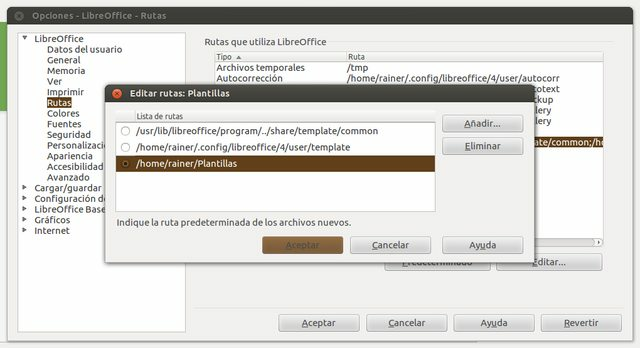 You'll see the paths used by LibreOffice. Double-click on Templates and the "Edit paths" window will appear, where you can add the route to your newly created Templates folder. @carnendil - Will a changed location o the templates be moved over to a newer version of LibO when upgrading or is it necessary to repeat the process over and over again for each upgrade? When upgrading LibreOffice your settings should -- and normally would -- be carried to your new version, including custom paths added. This definitely works with "point" upgrades (e. g. 4.0 to 4.1), but you might have to repeat the process if you have to uninstall a major version before installing a newer one (e. g. 3.x to 4.0). I know in Linux the settings are imported, I am less sure on Windows. @carnendil - thanks for this helpful information. @ camandel ... thanks for your help. I have opted to locate my templates on a second HD (C:\) a SSD. The default location for templates is in the bowels of "C:" not a convenient location for backing up. All my data and now templates are located on "D:\" drive. When and if I upgrade LibreOffice will my templates remain intact, ie, where I placed them. I have deleted the default paths (virtual paths) completely and it all works.